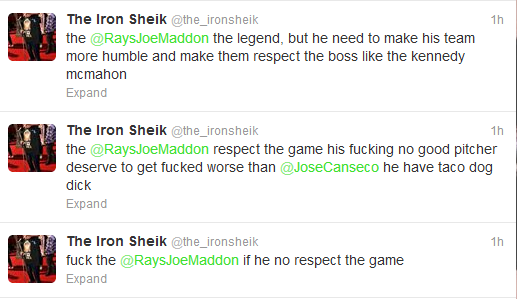 If you follow the Iron Sheik on Twitter, then you know he has some issues. The former wrestler has Twitter Tourettes and constantly tweets about Hulk Hogan, Chris Bosh, Jose Canseco and their tiny man packages. Well tonight, Mr. Sheik has taken a few tweets off from saying the f word and talking about men's anatomy to take a few shots at Joe Maddon after apparently hearing the news about Glove-Gate. So is the Sheik a Nats fan? Is he a Rays fan? Is he watching the game tonight? Did he randomly see it on SportsCenter and try to cash in on some trending topic? Is the Iranian who would throw sand in your eyes a big fan of playing by the rules? 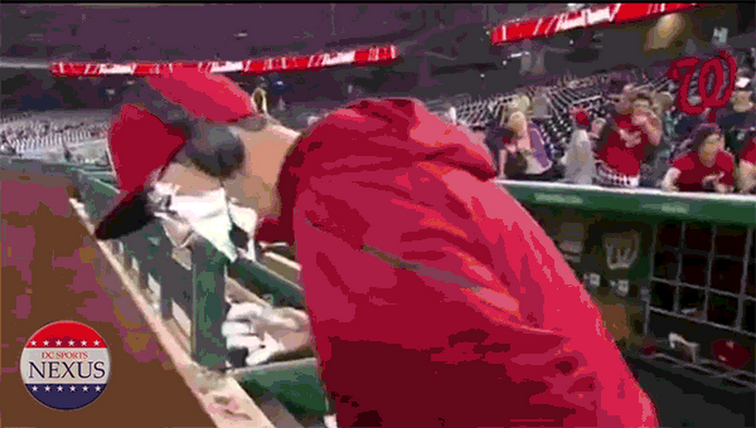 Or is he just a huge baseball fan who demands respect for the game. Sheik's tweeting style is like a MadLibs where he just throws in people mixed in with random cursing. But I agree, Joe Maddon needs to respect the game! I mean don't call Davey a P***y!